Solar panel inspection during final testing of GOCE satellite at ESA-ESTEC. The spacecraft is equipped with four body-mounted and two wing-mounted solar panels. In orbit, the same side of the satellite remains facing the Sun. 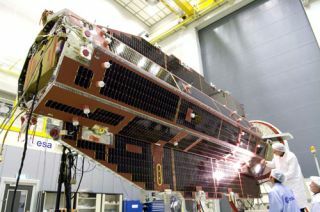 Europe?s gravity-measuring GOCEsatellite has returned toits exceptionally low operating orbit after a series of maneuvers thatsuccessfully compensated for a July anomaly that had shut down thesatellite?sability to transmit science data, the European Space Agency (ESA)announcedSept. 29. A pair of apparently unrelatedmalfunctions in and aroundthe computersystem of the Gravity Field and Steady-State OceanCirculation Explorer hadstopped data telemetry and forced ESA managers to raise GOCE?sorbit to 263 kilometers, some 7 kilometers above its optimaloperatingaltitude, while they worked to correct the problem. The higher orbit was needed so thatGOCE?s flight path couldbe maintained more easily even if its xenon-ion electric propulsionsystem wasswitched off for brief periods during the corrective maneuvers. DuringnormalGOCE operations, these engines provide thrust to counter drag on thesatellite?s orbital motion caused by residual atmosphere. Withtelemetry nowrestored, the satellite has been returned to its normal orbit and isprovidingits full complement of data. GOCE was launched in March 2009 on atwo-year mission. It had already compiled two-thirds of itsplanned dataharvest by the time its computer problems occurred. Because of theunusually lowsolar activity in 2010, GOCE used less drag-compensating fuelthanforecast. Its managers said they are likely to propose a missionextensionbeyond 2011. This article wasprovided by SpaceNews, dedicated tocovering all aspects of the space industry.